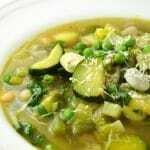 This Minestrone Primavera is packed full of green goodness. It's so healthy, fresh and packed full of all the flavours of Spring. Add the olive oil to a large pot under a medium/low heat. Cut the end and stalk off the leek then cut into slices. Cut the zucchini in half length-ways then cut into slices. Add the leek and zucchini to the pot and sauté until soft, add the garlic and fry for another minute. Add the green beans then the chicken stock. Bring to a boil then turn down to a simmer. Add the peas, broad beans, cannellini beans, basil and a pinch of salt and pepper. Simmer for 5 minutes then serve. Top with a grating of pecorino cheese. *Please not this recipe was tested and developed using metric measurements all imperial measurements are an approximate.